Gregg W. Peters, O.D. a.k.a. Dr. P. has been practicing Optometry in the York area for over 35 years. He joined Keystone Eye Care Group in May, 2007. Gregg grew up in the Chambersburg area, graduating in 1974 from Chambersburg High School. He then attended Gettysburg College, graduating with a B.A. in Biology in 1978. Upon graduation, Gregg studied Optometry at Pennsylvania College of Optometry in Philadelphia from 1978 to 1982, doing internships in Low Vision and Contact Lenses. 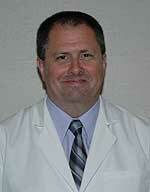 Dr. Peters is certified in the treatment of eye disease, glaucoma, and use of therapeutic pharmaceuticals. Gregg enjoys all sports, bicycling, and playing music with his church Praise Team and his wife, Marsha, who is a piano and voice teacher.